AC Milan defender, Alessio Romagnoli has identified Chelsea striker, Gonzalo Higuain as the “best striker” in the world currently. Romagnoli, a former teammate with Higuain at Milan, stated this ahead of Chelsea’s Premier League clash with Manchester City on Sunday. 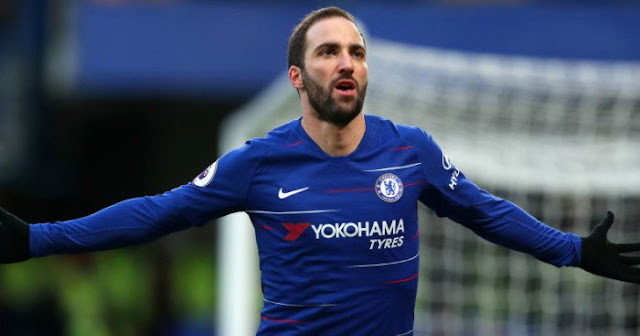 Higuain, who joined Chelsea on loan from Juventus last month, scored a brace in Chelsea’s 5-0 victory over Huddersfield Town last weekend. “I still think he [Higuain] is the best striker in the world,” Romagnoli was quoted by Calciomercato as saying. “I am sorry he decided to leave AC Milan but we respect his decision. He is a friend of mine and if he is happy I am ok with it. “Now we have other players that won’t make us regret his departure. “We enjoy having him here and we hope he can keep scoring at least one goal per game.